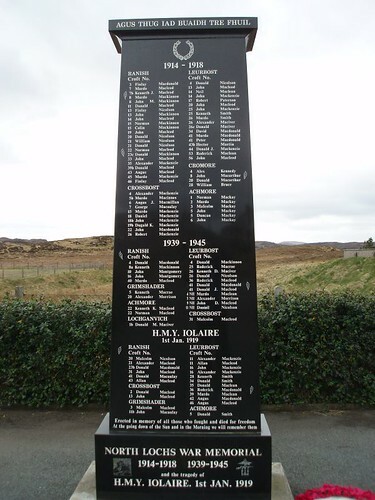 This memorial sits on the western end of the village of Crossbost, where the road comes in from Leurbost; about 3 miles from the A859 Stornoway to Tarbert road. It is clearly signposted, and sits close to the cemetery. It covers the villages of Ranish, Crossbost, Leurbost, Achmore, Lochganvich and Grimshader. Bus W8 (Stornoway to Ranish) passes close by.